Welcome to our coverage of Match 24 of the 2019 Indian Premier League in which three-time champions Mumbai Indians host Kings XI Punjab. That’s the game. Kieron Pollard and Mumbai Indians have done it. But it didn’t come without a twist. Ankit Rajpoot had the most disastrous start with the final over bowling a no ball that went for SIX and the free hit struck for FOUR. However, Rajput got his man – the big wicket of Pollard off the next ball and the equation boiled down to 4 needed off 4. A dot ball followed and Joseph and Rahul Chahar took two singles. Two needed off the final ball, Joseph drove a full toss down the ground and the TWO was completed. Mumbai win, the Wankhede erupts, as do the Mumbai Indians camp. Over 19: Pollard Power! Kieron you beauty. This man has changed the complexion of the game. This is how the 19th over read – 4, 0, 6, 6. 1, 0. This is power hitting at its brutal best. We don’t give him enough credit but Pollard as as good a hitter as Gayle. Sam Curran is flattened. Anything he bowls is disappearing. Mumbai 183 for 6, need 15 off the last over. Over 18: Shami completes a fabulous spell of 3 for 21. His last over costs KXIP a boundary, which Alzarri Joseph hammered through the off-side. Right then, Mumbai 166 for 6, need 32 off 12. Pollard is the key. Over 17: Curran does well to keep it tight but Pollard plunders a SIX off the last ball to reach his HALF-CENTURY off just 22 balls. He is the only one standing between KXIP and a WIN. Mumbai Indians 158 for 6. Over 16: Two wickets in that over from Mohammed Shami. He gets rid of the Pandya brothers to puncture Mumbai’s hopes. But as long as Pollard is batting, MI will breathe. But let’s take a moment to praise Shami for his efforts. His figures read an astounding 3 for 13 from three overs. Stunning. Mumbai Indians 144 for 6, need 54 off 24 balls. Over 15: Well bowled! A good over from Viljeon to give just seven in the over. Mumbai 135 for 4, need another 63 off 30 balls. It’s going to get close, folks. Over 14: Brilliant from Pollard, Pandya and the Mumbai Indians. Ashwin drops it short and Hardik pull the ball for FOUR off the front foot. After taking a single, it was Pollard’s turn to take on his his counterpart. And how? By muscling Ashwin for consecutive sixes down the ground. Another huge over as 19 come off it. Mumbai Indians 128 for 4. Over 13: Hardik Pandya up and running. Hardus Viljeon starts off with FIVE WIDES which wasn’t quite so. There was a spike on the snicko as the ball went past Pandya’s bat. Next ball, Hardik found the gap behind square on the leg-side. 15 off that over. Mumbai have scored 44 off the last three overs here to reach 109 for 4. Over 12: 18 runs and a WICKET! Needless from Ishan Kishan, who was midway through the pitch and failed to get back in time. Curran picks up the ball and strikes with the direct hit. However, Mumbai Indians finally get a BIG OVER. Sam Curran drops it short and Pollard swivels across to pull the ball into the stands. Next ball, he pitches it fell and Mumbai’s stand in captain whips it past short midwicket for a boundary. Two balls later, Curran missed his length by a whisker and down the ground went Pollard for one of the flattest sixes seen this season. Maybe that’s why Pollard promoted him up the order. Over 11: A FOUR from Kishan and a SIX from Pollard caps off a much-needed 11-run over for Mumbai. Kishan creamed the ball through the off side but Pollard – phew! Generates tremendous power to thump a SIX off the backfoot. Ashwin done with three overs and Mumbai need to keep ticking. 76 for 3. Over 10: Mumbai 65 for 3. Great over from Viljeon. Just three off the over, including a wide. Mumbai’s asking rate has climbed to over 13 an over. We’re through the half-way mark. What can Pollard, Ishan Kishan and the rest of the batsmen conjure? Over 9: WICKET! Retribution for David Miller, who takes a fine catch at long off to remove Quinton de Kock. He drills Ashwin down the ground but Miller does extremely well to cover a long distance and hang on to the catch. A wicket and four runs off that over as Mumbai score 62 for 3. Over 8: OUT! Sam Curran strikes in his first over. Boy! What a tournament is he having. Suryakumar Yadav flicks the ball but doesn’t time it to well. It lands straight down deep square leg’s throat where substitute Henriques takes the catch. Mumbai Indians 58 for 2 and skipper Kieron Pollard makes his way out in the middle. Over 7: Ashwin starts off well and almost with a wicket. Yadav pushes the ball back to the bowler but it just bounces before Ashwin could get underneath. Mumbai Indians 53 for 1. Over 6: Hardus Viljoen into the attack and it’s another DROP! Powerplay is done and Mumbai Indians are 50 for 1, just a wicket behind where KXIP were. Suryakumar Yadav used his wrist and tucked it away towards fine leg to collect a boundary. Off the last ball, de Kock went for the pull and Rahul, diving to his right put it down. There was definitely some glove on it. Rahul is exhausted from all the batting he’s done. Over 5: DROPPED! Miller puts down Suryakumar Yadav at point. A ball after he scored a cover drive for a boundary, the batsman cut the ball straight to point. Miller however did not time his jump well and spilled it attempting a one-handed take. What more? He adds insult to injury with two boundaries off the last three balls. Rajpoot could have really done with that wicket. Mumbai Indians 41 for 1. Over 4: BOWLED HIM! Siddhesh Lad walks too far across and is cleaned up by Mohammed Shami who keeps it full and a little leg sidish. The debutant goes for 15. Another fine over from Shami, just a single. Mumbai Indians 29 for 1. Over 3: 14 runs off Rajpoot’s second. de Kocks sets the tempo with a couple of boundaries – one a flick over the infield on the leg side and the next a cover drive. Lad and de Kock run three to cap off a good over for Mumbai Indians, who have progressed to 28 without loss. Over 2: Mohammed Shami begins with a tidy over, just two singles as Mumbai Indians reach 13 without loss. Over 1: SIX and FOUR! What a way to get off the mark on your IPL debut. De Kock gets Mumbai Indians off the mark with a single before Siddhesh Lad, on his IPL debut cracked a SIX off his first ball and follows it up with a boundary. Too leg sidish from Ankit Rajpoot and Lad just guides the ball along the way. Mumbai Indians 11 without loss. End of innings. Kings XI Punjab finish on 197 for 4. miss out on 200 but KL Rahul doesn’t miss out his century. He scampered through for a double to bring up his maiden HUNDRED in the IPL. That is, after he had begun the over with a SIX off Bumrah before the pacer came back with two dot balls. In the end, Mandeep Singh squeezes a ball through the off side to ensure KXIP end closer to the 200-run mark. Over 19: Rahul takes his friend Pandya on. 6, 4, 6 and 6 – that’s what he scored off the first four balls. 25 off that over and surely KXIP would want to go past 200 here. Out of nowhere, Rahul has raced to 92 off 59. Can he finish with a flourish here? KXIP 184 for 4. Over 18: WICKET! Sam Curran’s breezy three-ball stay comes to an end. 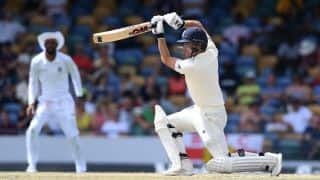 He began positively with consecutive FOURS off Jasprit Bumrah on the offside before trying to be cheeky and top edging an attempted Dilscoop to Quinton de Kock. Meanwhile, Rahul successfully squeezes a wide yorker for a FOUR. Further success for Mumbai. KXIP slightly pegged back at 159 for 4. Over 17: Mumbai Indians strike with another wicket. Hardik Pandya sends back Karun Nair after an attempted sweep goes straight to Rahul Chahar at fine leg. KXIP 143 for 3. Three overs remain. Can Mumbai keep KXIP under 175? It’s been a massive boost of they can. Over 16: KXIP 138 for 2. 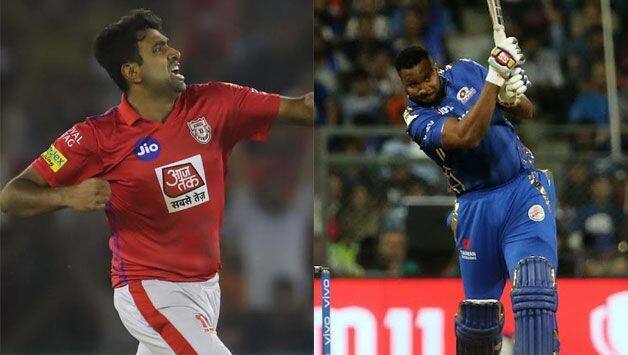 Here is Mumbai Indians’ chance to limit KXIP to under 200. They’re still 62 away from the mark but with Rahul still out there batting on over 50, they have a chance. But as do MI, who need to strike more frequently now. Ever since Gayle’s dismissal, the scoring rate as taken a dip. Over 15: OUT! David Miller walks back as Hardik Pandya gets KXIP’s second wicket. Full and wide and perhaps a faint edge as Miller goes for the swing. KXIP 131 for 2. Over 14: Gayle goes and suddenly the boundaries have been replaced by dot balls and singles. Chahar bowls a tidy over to conceded just four off it. KXIP 121 for 1. Over 13: GONE! Success at last for Mumbai Indians, who get rid of the dangerous Gayle for 63. A ball after he went down on his haunches decided to take on Behrendorff but didn’t time it as well as he’d have liked. The ball travels flat and Krunal Pandya takes a good low catch to finally give Mumbai their first wicket. KXIP 117 for 1. Over 12: DISPATCHED! Seventh SIX for Gayle. KXIP 113 without loss. Over 11: WHOA! Stunning SIX from Gayle to bring up his half-century off 31 balls. He literally seemed like pushing the ball for a single but that cleared the roped comprehensively. The ball thudded off the sidescreen and rolled back in. With that the 100 also comes up. Over 10: What was heading towards being a good over from Rahul Chahar, was spoiled by Gayle, who drills the legspinner over his head for his 5th SIX. He’s on 48 and KXIP are 93 without loss at the half-way mark. Over 9: A long over from Hardik Pandya comes to an end. Why? Because the fielders were busy getting the ball from the boundary. Chris Gayle has handed Pandya an over to forget. The batsman smoked Pandya for a SIX to open the over and hammered a couple of more boundaries to collect 17 off that over. A couple of WIDES from Pandya didn’t help Mumbai either. KXIP 86 without loss. Over 8: Just one of those days for KL Rahul. Silken touch. Rahul Chahar starts his first over with a fuller delivery and the batsman whips it to pierce the gap between deep midwicket and long-on. Perfectly timed. These are ominious signs for Mumbai Indians. KXIP 69 without loss. MI still in search of their first wicket. Over 7: Further assault from Rahul. Begins the over from Alzarri Joseph by pulling him over deep midwicket and takes the aerial route over covers for a boundary. KXIP are cruising at 63 without loss and this one is quickly getting out of hands for the Mumbai Indians. Over 6: FIFTY up for KXIP at the end of the Powerplay. They have motored along nicely in these first six overs. Rahul scores his second boundary with a drive through the covers. Over 5: Gayle goes BIG and that’s a humongous over for Kings XI Punjab. The big Jamaican has taken 23 runs off that over with THREE SIXES and one FOUR. He’s raced to 25 off 12 to help KXIP reach 43 without loss. He began the over with consecutive SIXES before cutting Behrendorff for a boundary towards square leg. And then finishes the over smoking the left-armer down the ground. BIG OVER! Over 4: Alzarri Joseph into the attack and KL Rahul welcomes him with a SIX. Full and onto the pads and Rahul whips it into the crowd near fine leg. What sublime timing, what touch. KXIP 20 without loss. Over 3: Slightly short from Behrendorff and Rahul crunches it through the off side to collect his and KXIP’s first FOUR. The boundary is followed by three singles to help KXIP move to 11 without loss. Over 2: Magnificent from Bumrah, who starts off with a fiery over. Quick, bouncy and on target is Bumrah with his first over. Just three conceded, KXIP 4 without loss. Over 1: Behrendorff is right on the money. Beats Rahul outside off first ball before the opener glides it to third man for a single. Good start, just one run off it. KXIP 1 for 0. Right then, just a couple of minutes away from the start of play. The dangerous pair of Chris Gayle and KL Rahul will open the innings for KXIP. For Mumbai though, the new ball is with Jason Behrendorff. Can he get that early breakthrough? Either wickets is going to be handy for the three-time winners. Kieron Pollard: We will bowl first because of the dew factor. We don’t think wicket will change much here at the Wankhede stadium. Rohit is fine but as a precautionary measure we have decided to give him as a rest. Siddhesh lad comes in place of Rohit. He has waited for 5 years to make his debut. R Ashwin: We would have bowled first too but teams have defended well on this track. We have a forced change in our team, Mayank has not recovered from his finger injury so Karun Nair will replace him. And Hardus Viljoen also comes back in the team. He will replace Mujeeb. Spinners have struggled to bowl 8 overs on this pitch so we have added an extra seamer. TOSS: No Rohit Sharma for Mumbai Indians. Stand-in captain Kieron Pollard wins toss and opts to bowl against Kings XI Punjab. After waiting for three years, Siddhesh Lad makes his debut. Kings XI Punjab on the other hand, have made a couple of changes with Karun Nair and Hardus Viljoen replacing the injured Mayank Agarwal and offspinner Mujeeb Ur Rahman. Hello and welcome to CricketCountry‘s coverage of Match 24 of the 2019 Indian Premier League in which three-time champions Mumbai Indians host Kings XI Punjab at the Wankhede Stadium. The last time Mumbai Indians (MI) faced Kings XI Punjab (KXIP) at Mohali this year, the former returned with an eight-wicket defeat – a loss that too after a gap of eight years at the IS Bindra Stadium. That was about two weeks ago. 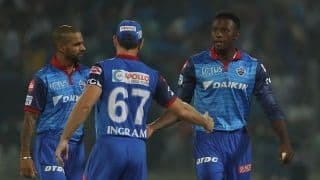 The three-time champions bounced back with back-to-back wins and now are eyeing revenge when they face an equally competitive Kings XI Punjab unit in the Indian Premier League (IPL 2019) at the Wankhede Stadium on Wednesday. KXIP seem to have the right ammunition for conditions at Mumbai. While it cannot be denied that they have played their last two games on conditions that weren’t best for batting – in Chennai and Mohali – they can take heart from the fact that their batting mainstay KL Rahul is back in the business of run scoring with Mayank Agarwal and Sarfaraz Khan proving good support systems. The visitors will want the Universe Boss Chris Gayle to come good.